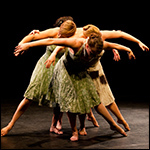 Gehring Dancetheatre offers a variety of dance workshops and master classes taught by artistic director Heather Gehring. Master classes can be custom-tailored but work ideally with no more than 20 students per class. This unique master class gives students an idea of what a day in the life of a Gehring Dancetheatre company member is like. Starting with her customized Gehring Dancetheatre company workout, Heather Gehring leads students in the core training for all Gehring Dancetheatre dancers. This original workout builds strength, balance, and technique, while focusing on the correct use and isolation of specific muscles though a blend of yoga, ballet, modern, and other stretching and strengthening methods. The remainder of the class focuses on exercises that push students’ boundaries of what is safe through simple partnering exercises, building the trust that is an integral part of working with a partner, and through inverted exercises that challenge the students’ perspective of dance and their own perceived limitations. Students will learn a piece of original Gehring Dancetheatre repertoire as taught by Heather Gehring, assisted by other company members. The workshop will begin by seeing the piece performed by company members, then continue by exploring not only the physical steps but the ideas that went into its creation and the feelings that are needed to successfully execute it. At the end the students will be given the opportunity to perform the piece in front of their peers. The pieces of repertoire are custom fit to each class, ranging from a solo, duet, trio, or group, with varying levels of difficulty. 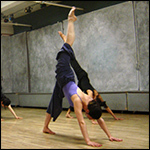 Artistic director Heather Gehring’s choreography is greatly influenced by techniques in the ballroom and social dance world. In this master class, students will work with Heather Gehring as she brings her extensive ballroom training and experience to the forefront. Using techniques from her teaching DVD “Ballroom Dancing for Tough Guys”, students will learn the basics of dancing with a partner, how to lead and follow, an introduction to waltz, swing, salsa, and tango as well as how these skills can be used in the modern dance world.